Forum Index > Off-topic Talk > Wearing a sax? Posted: Thu 18 Dec, 2008 9:22 am Post subject: Wearing a sax? How does one wear a sax? I've been told they were worn horizontally over the left hip. I've seen a number of repros, including my own, with rings atop the scabbard. Do you just run a thong through those and tie them to a belt? What if you want to wear it with a sword, which would also be slung on the left side? Chad, I have seen "Viking" reenactors wearing seaxes like yours hanging from two leather thongs attached to the rings horizontally across the small of their backs, as well as from either their left or right hips (depending on their sword-handedness). Don;t know if this is correct from a historical point of view, but who knows? It seems to work, though. The link below from Hurstwic shows a photo of a figure from a "A 10th century burial cross in a churchyard in Middleton, Yorkshire", where the saxe is worn horizontally. My small research into this has also indicated that the saxe was worn in this manner, although I'm sure that individual variations occurred, as would be expected. Chad - what is that piece, tip to tail... 10, 12 inches? If so, and especially with the ring placement, I'd wear that particular piece horizontally across the back - put a couple of belt loops of equal length (or the one toward the tip slightly longer - maybe a half inch) through the rings. You could also have the option of hanging it from either side in a vertical orientation by using only the hilt-end loop, letting the other just hang free. If it's smaller, you might also be able to wear it horizontally at either the right or front even with a sword. I'm getting the feel from the pics that this is more of a utility knife than a war knife - it's short. It should be handy, and not hindering. I bookmarked this site from someone's prior post. Page 25 illustrates an interesting suspension for your seax. Here's my set up. I like to have it on a angle for safety reasons, its tight in the sheath but she is sharp and one can never be to sure. I think you can allow yourself a little artistic license with the angle it is hung. As long basic principle of having 2 suspension straps is not taken out of the equation. Now with the longer examples almost sword length, they seem to sit well across the back. There is a stone carving of a man wearing a seax on the front of his belt horizontal with the hilt pointing to his right hand. It is what most people base the wearing of a seax on. You can stitch straps around the metal rings and then put a brass rivit on each, I will add a paint drawing to clarify. That's almost exactly how I wear mine; in front pommel to the right, edge up. I tried along my back and found it uncomfortable, plus it often snagged on things. I'm very very right handed, so pommel left is not an option, though I would prefer edge down if all of the evidence didn't argue against it. I am not aware of any evidence for the wearing of a seax at the back. This may have happened but there is no evidence. If I were to wear mine- which is about 5 inches or so longer- I would wear it at my front hanging horizontally. It does look a bit odd to the modern eye but that's the evidence we have. I don't re-enact much, I look a bit old for a warrior these days but when I do thats how I wear mine: edge up, hilt to the right, horizontal, front of the belt. Disclaimer- I have never owned a seax. Having said that, i do often carry a Becker BK7 when I'm out hiking in the woods. It is not a small knife but it carries well in a custom sheath across the small of my back, just past my right kidney with the grip toward my right hand. Historically, people are often smart and inventive. I'm sure some viking somewhere along the line said to himself "Gee, this big knife really would fit well right here on my back like this..."
Hi Chad, that's a great looking sax you've got there! I've not seen any scabbards preserved with loops for broken back saxes yet. But I suspect they were just leather loops around the belt through the rings as you mention. On earlier sax scabbards there's sometimes remains or indications of the leather loops. In some occasions these loops may have had small buckles to fasten them, but I don't have any direct evidence to support this. A few year back I saw a documentary where Samic people on the russian side of the finnish border were herding reindeer. To my astonishment one man was wearing what looked more or less exactly like the viking war knife. A knife with a blade length of some 40 cm narrow and thick in the back, symmetrical point. Short grip and all encasing scabbard worn with the edge up in three suspension rings. 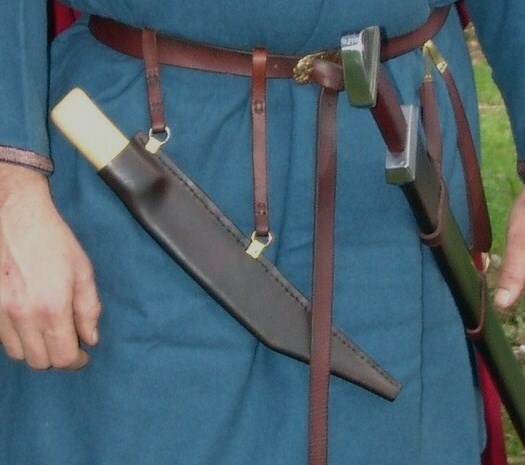 This modern reincarnation even had bronze decoration all over the scabbard, but in transverse strips rather than a row of "clips" along the seam. The knife was carried grip up and point slanting down at about 45 degrees angle. There were three chains of bronze attached to the belt from the rings in the scabbard, only the shortest, the top one, was straight, the other two were increasingly slack. They still provided some stability though. This mode of carry meant that the handle (with ever so slightly protruding end) was handy at about hip height and that the knife followed the body movement alongside the right thigh. All preserved seax and weapon knife scabbards I have seen have had one front side and one back side. The front side is invariably the one seen when the knife is worn edge up and the handle to the right. This side carries all or most of the decorations. Carrying the knife in the small of your back and the grip towards your right, means that the decorations would face towards your body. 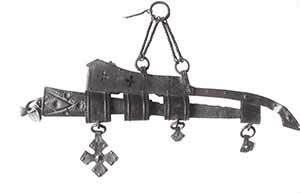 With this "Samic" suspension method, the long knife was carried almost like a low slung revolver. In some cases viking age weapon knives (and I hesitate to call the viking war knives seaxes, as they are pretty distinct from the continantal seax in shape and style, even if one might believe the function overlaps) have details remaining of embellishment that were threaded on to thongs that were attached to the end plate of the grip. The thong(s) provided purchase when pulling the knife out of the long scabbard. I have seen nothing to suggest seaxes had the same solution. Probably the scabbards did not enclose the grip quite as much as on the viking long knives. In some cases most or all of the grip of the seax was exposed. When the knife is drawn from this position it is held at the ready for a low (and sneaky?) thrust. In any case, it made sense to me seeing that samic man. The way he carried his long knife was very functional looking. It would also allow a sword to be carried on the left side, and also allows the decorated side of the scabbard to face outwards. All the while allowing full freedom of movement. Both weapons would follow the movement of your hips and be out of the way, not tangling your legs. 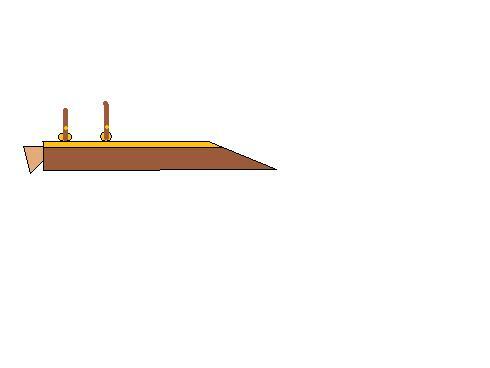 With some seaxes having a blade length of 60 cm or more, horizontal carry across the belly is not terribly functional. The point or the grip will poke those around you in their tender parts. Perhaps a way to show you fear no man? So carrying the seax on the right hip with the point slanting down might be an option? Not one supported by pictorial evidence of viking or anglo saxon context as far as I know, however. There are images from other places where long knives are carried in a similar way though. Pär Olsén in his "Die Saxe von Valsgärde" write about the finds from the boat graves. He draws parallels (origins?) 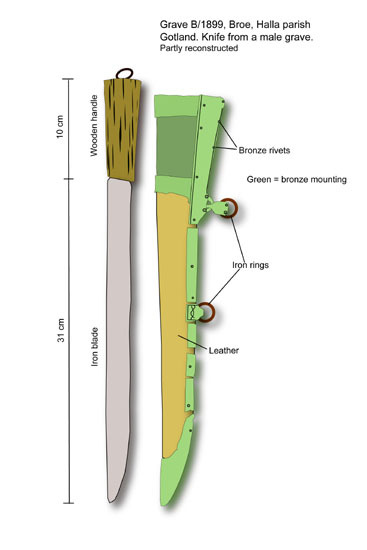 to the european seax from knives and short swords used by steppe people. He mentions the Scythians and Persians pointing out how their weapons could have influenced the early forms of the seax. Scabbard mountings do show similarities early on and the principal function of these scabbard fittings carries through all the time the seax was in use, even though they do change shape over time. here are a couple of extant sheaths for you to look at.....Though these are Frankish from memory? They are still Viking age. This one is from Gotland. When I first saw this type of knife and there unique elaborate sheaths, I figured the Rus must have copied these from there nomadic neighbors. I have not come across any examples like these in Nomadic burials eg Magyar, Khazar and Alanic peoples. Some of there knives are quite plain and small, some elaborate, but nothing like these knives found in Baltic regions. After some further reading and study, these knives and there fabulous sheaths are a trait only really found in Baltic areas. The female Baltic knives though smaller, have even more elaborate sheaths. Posted: Fri 19 Dec, 2008 4:58 am Post subject: A lady's sax? Perhaps not exactly a sax, but the 10th Century grave on the Isle of Man known as the "Pagan Lady's Grave," has a short broken back, pattern welded, sheathed knife that was carried horizontally across the small of the back of the corpse. The blade of this knife was approximately 4 inches. The handle was also about 4 inches, made of a dark wood, wrapped in twisted silver wires. 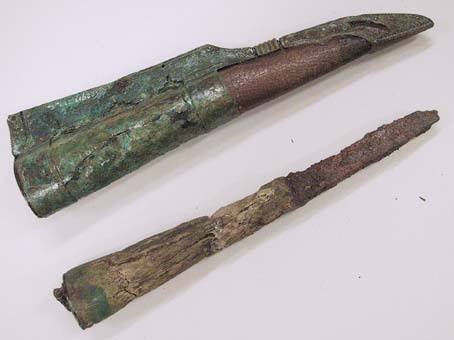 The knife was apparently suspended horizontally from a tablet woven belt, with the hilt to the left. 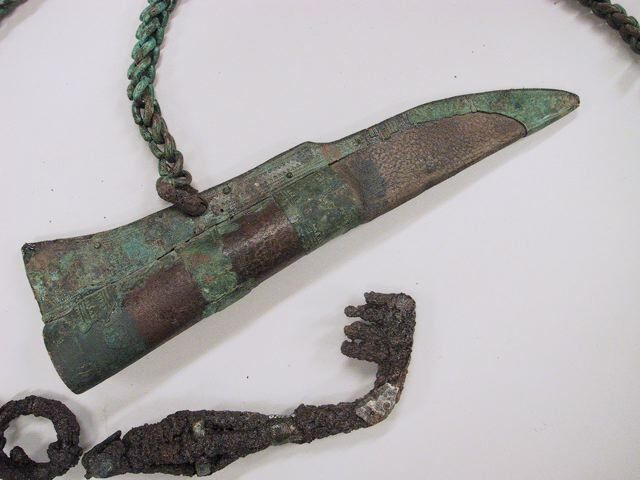 This grave also contained another knife worn on the right side, hilt up, but this knife is considered to be more of a utility tool as it was accompanied by scissors and a comb. Overall, one of the best preserved lintel graves of this period. Chad - what is that piece, tip to tail... 10, 12 inches? It's about 13 inches, all told. It's more of an everyday knife but is big enough and stout enough to be usable as a backup weapon on the battlefield. Thanks! Though Tod is capable of much fancier versions, this one fit my budget. It's a nice, basic sax. 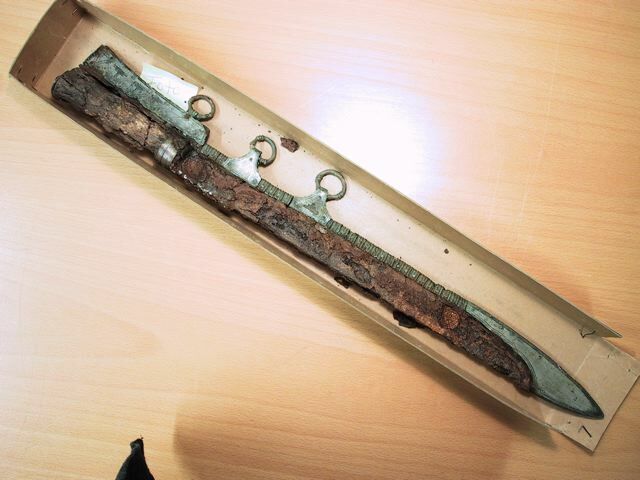 You show an example of the viking war knife I was talking about. Like the utility knife in the post above, it is not a true seax, but it might still hint at some options that we cannot make out in the remaining pictorial evidence or finds. Since we have to make some assumptions, we might as well look at other but related types of knives. Below is a snapshot of an example in storage in Uppsala, collection of the Uppsala University. It seems they are belong to the baltic region. When found in russia, they are called norse, or viking knives. In sweden it is norm to stress their eastern origin. The type might be traceable to eastern cultures, but the making was most certainly local, as the decorations and construction method is exactly the same as the smaller utility knives knives often found in women´s graves. I also include two examples of those small utility knives (same type as the one in the post above).